Welcome to EZ-Load Game Cart! Home of game carts that make hauling deer, elk and other big game easy. Hunting in rugged terrain is a lot of fun but can be difficult after the hunt, when trying to haul out your big game. For that reason, I designed a game cart that is versatile for many types of terrain and applications. The first EZ-Load Game Cart was fabricated in the mid 1980’s. It had a single wheel with a removable wheel assembly. Since that time, the game carts has been improved to a point where it is a great asset to any big game hunter, especially with today’s limited driving access. 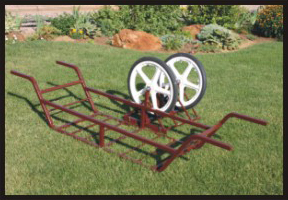 These carts can be used with a single wheel, two wheels and there is even an option for a three wheel assembly. Check out the possibilities with EZ-Load Game Cart.